High-school track season is again upon us, and with it, a running rejuvenation from the doldrums of winter. 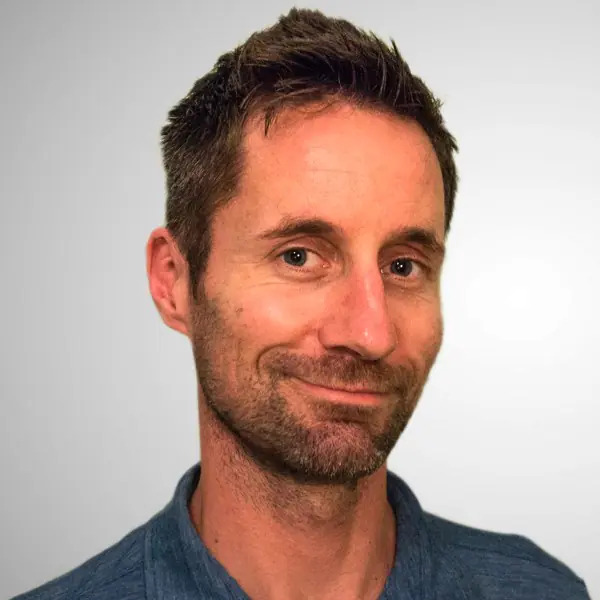 As a returning coach, blessed with a mix of fresh faces intermingled with veterans, tough decisions must be made on how to best develop fitness and performance in a painfully short 12-week season. For me, priority one is easy: stride efficiency. It always comes first. How we move our bodies as runners is the most powerful factor in how we feel and perform. Fast and fun running starts and ends with efficiency. How we go about finding and reinforcing efficiency isn’t so clear cut, though. Eight years ago was the first time that I, as a physiologist, tried to coach running mechanics. My first ‘victim’ was a talented high-school sophomore with knee pain. As I watched her knees buckling inward, even after my prescription of clamshell hip-strengthening exercises, it hit me, We need to change the way she runs. So I coached her. I didn’t really know how. While there are volumes of data on running mechanics–the nuts, bolts, angles, and forces–there exists no biblical text on running stride coaching. In fact, there’s next to no evidence-based literature out there that reads, “Tell a runner to do this, and observe this outcome.” I surmise that both running and the coach-athlete interaction is simply too complicated for a one-cue-fits-all guide. So you wing it! Early on, it was tough going with a lot of trial and error. I like to tell people that that this young girl went on to run varsity for the University of Oregon–but I will take no credit for that. For that runner and I, it was nearly as much error as trial. People can only focus on one concept at a time. Focus areas such as ‘knees, feet, hips’ or other cues can’t be multitasked. Juggling more than one is nearly impossible. Pick the one strategy that fixes two or more issues. Vehemently avoid any strategy that fixes one issue, but ruins two or more elements. People don’t do well with anatomical verbal commands like, “Knees out,” or “Hips behind!” They do best with a visual and a feeling. From this last lesson, the phrase ‘look fast, feel fast’ was born. Then we watched each other. Highlighting our most graceful runners, the strategy became, “Look like Callan,” who was, at the time, the team’s fastest boy. With very few words, the rest of the team simply emulated Callan’s stride. And with hardly any effort, they all looked similar. And more efficient. From there, we honed our approach to this cue, “Look fast, feel fast, and run fast.” We further simplified the cue to ‘look fast, feel fast’ because those first two elements create stride efficiency at any speed. The results a year ago were clear. We had fast runners (including several state track meet scorers, including two state championships), but even better, no injuries. Amongst our entire team, we lost a total of one week to injury. For Christmas, my brother gifted me a curious book, The Inner Game of Tennis: The Classic Guide to the Mental Side of Peak Performance. As I paged through it, I thought, He obviously doesn’t know me that well. Or does he? Author Timothy Gallwey’s work is now considered both a timeless critique of conventional motor learning and an offering of a more natural and effective way to optimize athleticism. As I read the book, it became clear exactly why many of my earlier stride-coaching strategies failed, and why some–like ‘look fast, feel fast’–are so effective. While there are some differences between a sport like tennis, based predominantly on skilled control of the tennis ball, and running, where outcomes are more effort-based, the challenges and strategies still apply. We don’t know when to stop minding the cue. How long and how continuously must one think about feet or arms? What happens when we stop thinking of that cue? We don’t know how much is enough. No cue or strategy is analog: there’s no correct amount of arm swing or cadence. Rather, every movement is a continuum, and each person has a happy medium. Where is it? Loss of enjoyment. Thinking about a cue can be distracting to the run’s overall movement and relaxation. Effort. When in doubt, we try harder. More swing, more feet, more, more, more! Without fail, more effort brings more tension, which increases effort and decreases enjoyment. More criticism. When we fail to look or feel (perform, or decrease stress) better, self-criticism increases. Back to the top of this list we go, and through this cycle with more voracity or perhaps more stride cues! And before long, we’re buried in mental and physical fatigue as well as frustration. Nonjudgmental observation. In a very yogic fashion, this approach advocates observation without judgment. What am I doing, and how is it feeling? A certain running strategy in your ultramarathon gear may feel okay, but how does it look? Does it look efficient? Does it look fast? Does it look like someone who runs well at the end of an ultra? The other question is, what are the results? Am I injured? Is my running limited by aches, pains, or other performance issues like blown quads or cramping? Is there any relationship to those issues, and how I look? This is a great starting point that nearly any runner can perform, regardless of knowledge of running stride. Visualize the desired outcome. A picture is worth a thousand words. 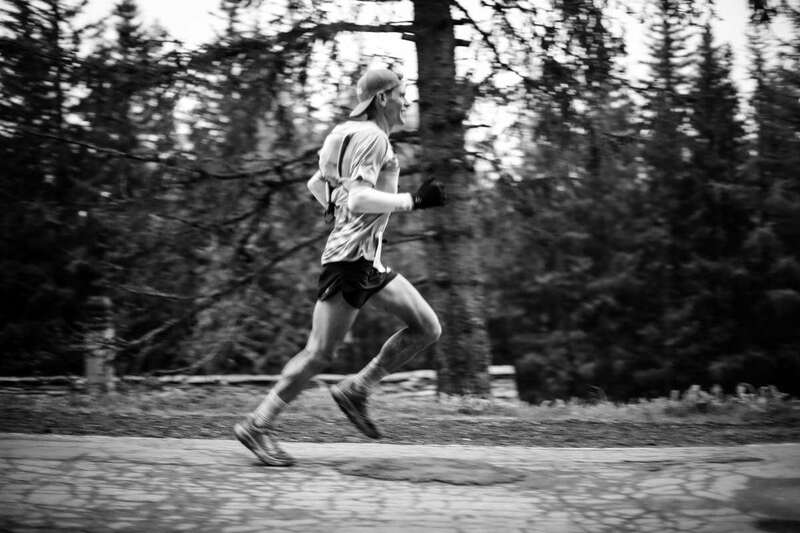 What does an efficient, fast, and successful runner look like? (Hint: they look like this.) Have a visual image of ideal. Even if that example runs much faster than you, how he/she moves his/her body is a crucial reference point. See it, then visualize the entirety of the movement pattern, both elements of posture and propulsion, what the arms are legs are doing. Let it happen. Don’t think [about everything], just do. Make yourself look like that fast runner. Orient your body in that shape, and then move your body in that motion. Nonjudgment observation of results. After the fact, reassess. How did it feel? Both at the time, and at the end of the run, what felt different? In tennis, outcomes are easy to measure. Did the ball travel where and how I wanted it to? Was it in or out? Did I win or lose? With running, it’s less transparent. In running, we often develop inefficient compensations. These are strategies or movement patterns that still allow us to travel from point A to B, but are less than ideal. We may finish that long run, but with a bit more fatigue than our running partner, or with more blown-out quads, or with blisters or bruised toenails. These compensations may be so rigidly entrenched that they feel easy. Conversely, when attempting to ‘look fast, feel fast,’ it often feels much more difficult. We discussed this paradox at length in this column–and the notion that a little bit more energy up front pays off many times over in the long run. This is the energy paradox: what feels easy now, may be more inefficient–slower more stressful–in the long run. What feels difficult now will, in time, be much more efficient, faster, and less straining. Thus, the ‘fast you’ at the outset of this practice may feel more labored. This is a major deterrent to stride optimization that must be overcome. To do so, we must revert to step two and ask, how do I look? If you look fast, you’re more likely to use less energy in the long term, once you’ve honed that new strategy. That’s where we segue into step three, letting it happen. Once we find the ‘fast’ stride, we must execute that stride with the least effort and most relaxation. Force nothing. Let it happen! Seek out examples of fast runners. Watch the sport’s fastest runners. With the ubiquity of social media, examples abound of excellent fast-looking strides. For the best results, find a gender- (and if possible, age-) specific example. Commit this person to memory. ‘Look fast, feel fast.’ Adopt and maintain the visual and feeling of your fast-running example. Interval workouts. Short speed workouts ranging from super-short strides, hill sprints, or other hard-easy intervals (less than 100 meters long) will allow you to practice your ‘fast you’ stride interspersed with rest. Run and walk. This is the easy-running equivalent of interval training. And what is more ultramarathon-specific than a run-walk? Efficiency in both running and walking always trumps a stiff, clunky ultra-shuffle. Lose the ego and ‘look fast’ when running. Then look fast when walking, too! Give yourself permission to act fast. Perhaps this should be step zero, for I think many runners simply refuse to move efficiently because they believe, Oh I’m not as fast as [insert faster runner here]. In an effort to self-preserve, they adopt a ‘slow runner’ stride. Allow yourself to look fast, regardless of the speed. The skill development of looking fast across all speeds will come with practice, but only if you give yourself permission to act that way. Stride optimization is so much more that joint angles and landing forces, yet at the same time, is so much less. Simply looking and feeling how you want to run is the first and best step you can take to faster, farther, and more fun running. Have you ever intentionally worked on your stride technique? If so, how did you approach the process? What techniques did and didn’t work for you? 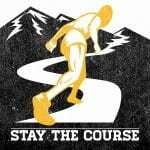 If you have worked on your stride technique before, did running more efficiently seem more difficult at first? How long did it take before it started to feel as easy as your previous run stride? When you visualize a fast runner, as Joe recommends, who do you visualize and what parts of their stride do you think of? 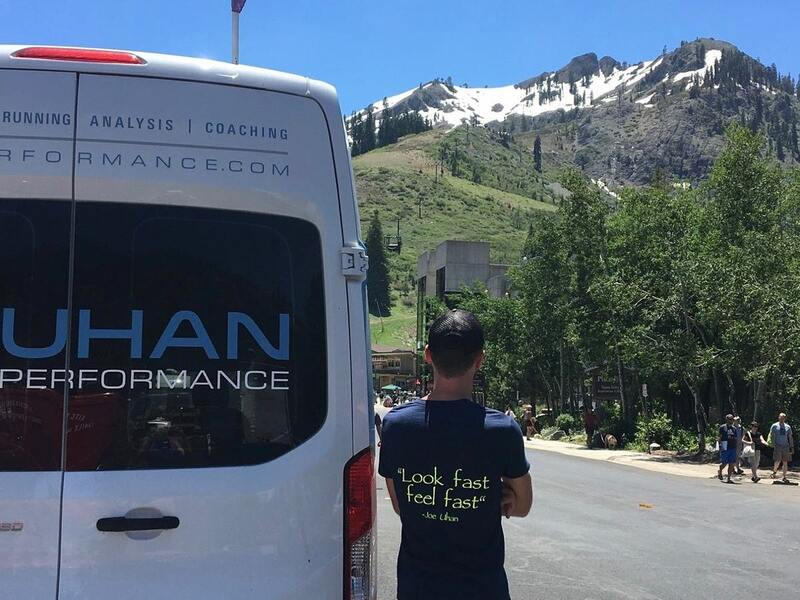 Joe Uhan in his ‘look fast, feel fast’ t-shirt. Photo courtesy of Joe Uhan. Thanks for articulating the process in the article. It helps me understand part of what is going on with my efforts to become more efficient. Love it. My visualization cue has always been Climb like Walmsley, Descend like Emelie. I use these to videos for the visual. Chi Running is a great book. It explains running mechanics by teaching some basic principles of locomotion, and posture. I was doing 2-mile intervals today and struggled on my 2nd of three, running it in 11:16. FOr my last rep I visualized Eliud Kipchoge and other elite marathoners. I often watch nearly every major marathon as well as YouTube videos that show them in slow motion. My last rep had a stride rate if 191 and a stride length of 1.51m giving my a time of 11:00. The best part is, 90% of that rep felt easier than the one that was 16 seconds slower. Visualizing and emulating the greats definitely works for me. Great article. I have over-analyzed my stride in the past, read lots of books, tried to be really focused on positional cues, everything. As I got older and delusions of speed diminished, I just figured I’d deliberately run slower. That actually did not help. I think what I stumbled into was what you describe – what do I look like / how does it feel? Does it feel like running, or just slogging. I’m not going to get speed back at my age (gah that is hard to say), but I at least can feel good while running. Envision yourself as Bekele running WR 10,000 meters! How to run fast when tired: Miller and Hawks, watch from 15.35. This has always been one of my fav running vids. I read the Inner Game of Tennis about 15 years ago when I was playing badminton compoetitelvely. It really helped me with certain aspects of my game then, maybe I should go back and read it again and look for my own insights into my running. What a great article. I’m going to make this the theme of my next juniors coaching session. Thank you. love the article, Joe. Practicable stuff. Looking forward to putting much of this into practice, and to forwarding the article link to a coach friend of mine who could benefit.